On average, about nine tropical cyclones form in the South Pacific tropics between November and April. Three or four of these leave the tropics and nearly all of them undergo a marked transformation to a mid-latitude cyclone – a completely different weather system – before they reach New Zealand. For a while after this extra-tropical transition, the system may be referred to as “cyclone so-and-so” (i.e. dropping the word "tropical"). 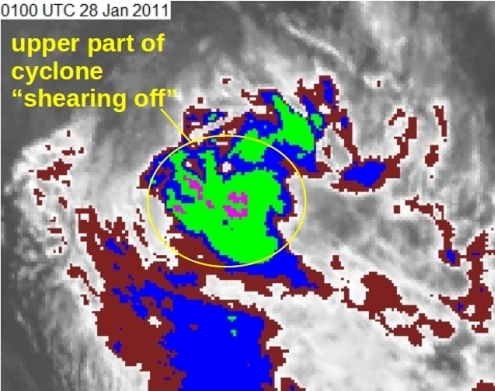 At this stage of its life, the system may still have considerable potential for severe weather, despite its name change – for example, Cyclone Bola, in March 1988. So, how does this extra-tropical transition take place? When a well-developed tropical cyclone reaches its peak in the heart of the tropics, it has an eye. 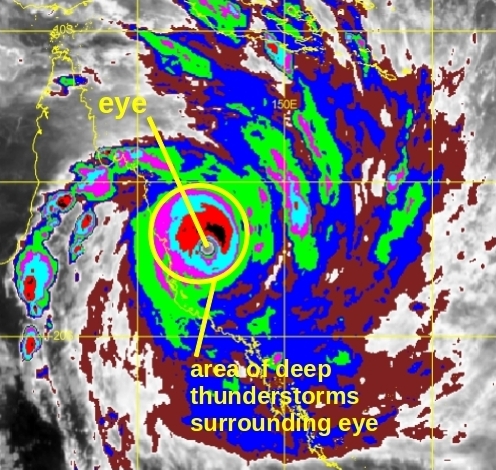 The eye is often fairly cloud-free, nearly circular, and surrounded by a ring of very active thunderstorms. In the early and middle parts of their lives, tropical cyclones stand up quite vertically in the atmosphere, like large columns. Infra-red satellite image for 10pm 02 February 2011 (New Zealand Daylight Time); this image displays colour-coded cloud top temperature. Tropical cyclone Yasi is just about to make landfall on the Cassowary Coast of northern Queensland. Besides encountering cooler seas, tropical cyclones heading towards New Zealand eventually come under the influence of the westerlies. The westerlies of the mid-latitudes increase in strength with height, a phenomenon known as vertical wind shear. This shear almost literally chops off the upper part of the tropical cyclone and sweeps it away, not unlike a woodcutter chopping off the upper part of a coconut tree to leave a section just above the ground (except it's a much more gradual and subtle process). Along with the lower sea temperatures of the mid-latitudes, this destroys the positive feedback processes within the cyclone. What remains is the former tropical cyclone’s low-level circulation, which may get carried off in the westerlies or become the focus of further development if conditions are right. Either way, tropical cyclones approaching the New Zealand area undergo drastic changes of structure and appearance as they undergo this extra-tropical transition. Let’s take a look at the extra-tropical transition of Wilma, which affected New Zealand in late January 2011. While in the tropics, Wilma had a similar look to Yasi, but was a less intense tropical cyclone. 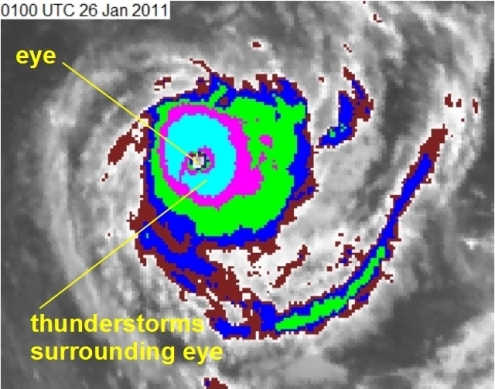 In the above infra-red satellite image (for 2pm Wednesday 26 January 2011 New Zealand Daylight Time), we can see a well-developed eye and the ring of thunderstorms surrounding it. 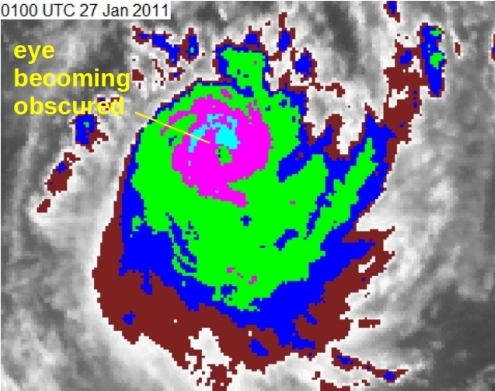 24 hours later (2pm Wednesday 26 January 2011 New Zealand Daylight Time), at the margin of the tropics, in response to increasing wind shear, the eye of Wilma became obscured amongst a broader mass of colder topped clouds. 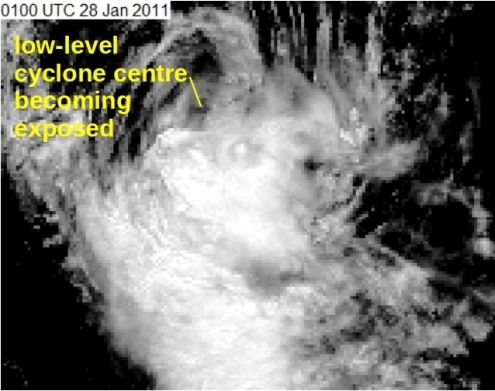 And 24 hours further on, Wilma’s cloud structure bore little resemblance to that of 26 January. The eye and eye-wall are no longer identifiable. Finally, we take a look at the visible image for the same time as the last infra-red image above. This shows the more active, colder cloud tops (bright white) are now east of Wilma’s low-level centre. Therefore, Wilma is on the verge of losing its tropical cyclone status and becoming classified as an extra tropical cyclone. Like all other cyclones before Wilma, Wilma lost its tropical cyclone status before reaching New Zealand.